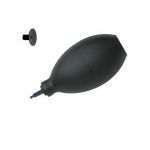 BULB-VAC with 1/2" diameter ESD-Safe Conductive Silicone vacuum cup. Our vacuum-bulb type tools are the lowest cost pick-and-place tools available. These tools operate very similar to a tweezer. Simply squeeze the vacuum bulb, place the soft suction cup to the part to be handled, then relax your squeeze and the part is firmly gripped. A second squeeze releases the part. Purchase Virtual Industries Bulb-Vac Vacuum Tweezers sold by Howard Electronics Today!